This week at PopMatters, I talk about my recent field trip to The Art of Video Games exhibit in Washington, D.C. The piece is mainly about the pleasant experience of seeing "living" history. It's unusual to visit a museum in which the items on display are both contemporary and historical. With the exception of some of the older consoles, all the technology on the display is easily available. All of the games can be played outside the context of the museum using emulation software or the original hardware. The vast majority of the game designers are still alive, as are the people that played the games when they were actually released. At the same time, enough time has passed and technology has changed to such a significant extent that such an exhibit is warranted. All this means that, unlike most of the other Smithsonian exhibits in D.C., visitors to The Art of Video Games Exhibit will likely have some primary knowledge about the artifacts on display. While walking through the exhibit, I heard a constant stream of statements like "Remember when we bought our old Atari?" and "I played hours and hours of this game when I was your age!" The kids of the 1980s and 1990s, now adults with their own kids, were passing along their personal stories to supplement the information on display in the exhibit. Such first-hand knowledge won't be around forever, and I was glad to see such a dynamic in person. For a more far reaching discussion, I'd recommend listening to this week's podcast. Jorge and I discuss my visit and touch on some of the exhibit's philosophical underpinnings and the future of video games in museums. The exhibit wasn't perfect, but I think it is a good early effort in figuring out how to preserve video game history. 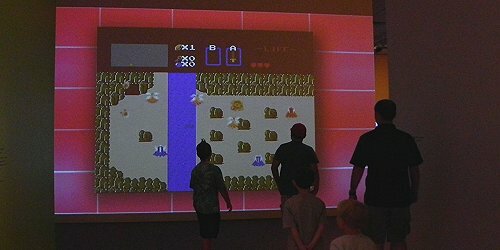 Interactivity is what makes video games special, so it was only fitting to see the exhibit inspire so many people to share their own connections with the medium. As long as mothers keep teaching their daughters to play Pac-Man, I'm hopeful for the future of video game history.